Tuesday, April 12, 11:45 – 2:15pm. 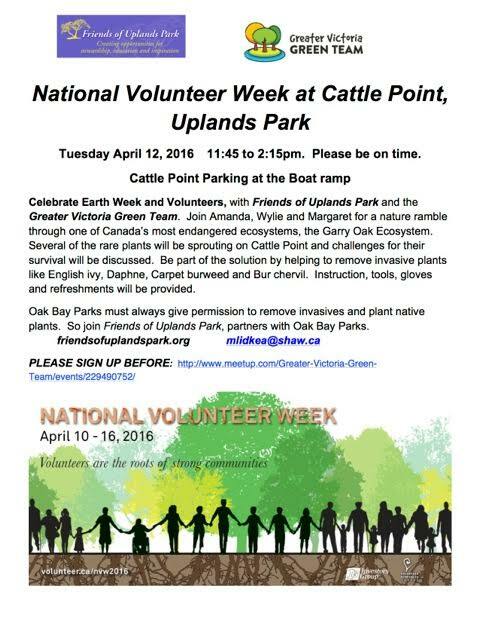 Volunteers from the Friends of Uplands Park, and the Victoria Green Team, invite you to celebrate Earth Week and the work of volunteers in Uplands Park. Margaret and Wylie (FOUP), and Amanda (Victoria Green Team), will host a nature ramble showcasing the Garry Oak meadows, one of Canada’s most endangered ecosystems. Many of the rare plants are now in bloom. This is also an opportunity to help remove invasive plants such as English ivy, Daphne, Carpet burweed, and Bur chervil. Tools, gloves and refreshments will be on hand. Contact Margaret Lidkea, FOUP Chair [mlidkea@shaw.ca] for more information.